My TMC 60 tank as it was in july 2015. Notice the input and output on the same side? Plus a powerhead was added next to it. 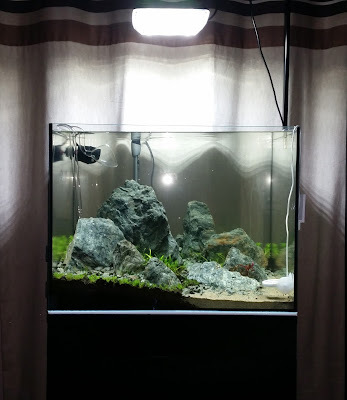 This was done like this firstly because the tank was not too large so achieving a circular flow in this was easy, secondly the powerhead was added beacause the tall rocks would inevitable break some of the water movement. The positioning of the power ahead was also to avoid conflicting flow. Let’s imagine this, you spend months researching your new planted tank, and after all that hard work it’s time to set up your system. You got a good light unit, co2 system, substrate and hardscape and all the necessary equipment to setup your new successful aquascape. On the day the plants arrive you can barely contain your excitement, finally you are gonna get a nice planted tank for your living room, just like the ones you spent months idolizing on forums and youtube. On the big day you wake up early, a friend comes over to help you position all those heavy rocks you bought, and to help empty all those packs of beers you got extra just for today. The wife, having been warned ahead decides to take the kids out of the house not to spoil your big day. We’ve all been there, myself included. So after a full day of hard work, your new pride and joy is ready. You sit back and enjoy your creation, it looks perfect, everything is has you dreamed of. Now you just have to sit back and wait for the plants to fill in, but nothing can go wrong now, after all you did your homework and predicted everything to the minimum detail. After two weeks you come home after work, and while going to the kitchen for a snack, you take a glimpse at your pride and joy, it still’s looks beautiful, but something seems to be off. You quickly grab a sandwich, a can of beer, and run to the tank. Hoping your eyes were fooling you. 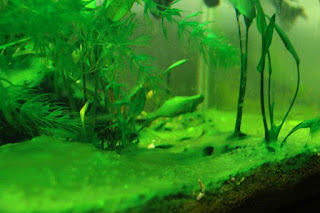 But they are not, your once beautiful aquascape is not looking so beautiful, plants are covered in algae. “Algae?” you think. “How can this be? I did everything right”. “I can’t have algae”. You reply to yourself outraged like if the world is conspiring against you. And what type of algae is that? You don’t even know, after all you prepared so well that you thought that you’d never have to worry about algae, all those hobbyists crying online where just too lazy to do their homework or too cheap to get a proper system. At first you’ll blame the light, either too much or not enough, you’ll start setting and resetting your system constantly, possibly if not surely making matters even worse. Now you are getting desperate and if it’s not the light it has to be your nutrient dosing, “ I must be dosing too much”, there you go you stop dosing nutrients and increase your water changes hoping this will solve your problem. And when your plants start showing poor health you will probably think it’s after all a lack of nutrients and just drop the entire flask inside the tank. And all this time those small strands of algae have turned into a carpet, covering all your plants and rocks. You up your co2 to the point your fish are swimming around carrying oxygen tanks. You’ve got light, nutrients and more than enough co2, still algae is growing rampant. Now here’s where it gets tricky, just having those things in the tank is not enough. Are you sure your plants are getting them? Check again, there’s a small variable that you might be ignoring, actually everybody seems to do it. And that is water flow. Flow is probably the most important thing in the planted tank, all right I know the same is said about light, co2 and nutrients. And these ones are really important, but the problem is that without good flow having them is useless. Without proper flow in the tank all the co2 and nutrients are just not getting to where they are most needed, and that is, your plants. And this can result in all kinds of problems, unhealthy plants, stunted growth and of course algae. This is even worse in aquascaping, because we all like to do our super complex hardscapes and these rocks act only as one thing in the tank, flow breakers. Ultimately they help break the flow and create dead spots in the tank. Never underestimate flow in your planted tank, always setup your tank to have at least a 10X filter turn over, not only this improves filtration but will also provide that much needed flow. There is no over filtration here, what you really need is the flow and we all know how these filters lose capacity once filled with media. If you have a very long tank or a scape with lots of dead spots I suggest you go with two weaker filters, but that both will provide that same 10X turnover. If you can’t afford another filter you can always add some powerheads, even though they are more common in salted water, they will provide much need help in increasing flow to your tank. When it comes to setup your flow it should be setup so that it flows in only one direction, e.g front to back or left to right, putting the output of your filter on the same side of the filter is a good idea as it generates a circular flow around the tank. This however is not set in stone as larger tanks and tanks with lots of hardscape may need different arrangements to optimize water movement. If you add powerheads place them facing the same direction of your filter output. Spraybars can help greatly in getting that extra flow efficiency. Avoid conflicting flow sources, like powerheads facing filter outputs. That will not help at all. If you use carpets having a powerhead point towards it might be a good idea, and in some cases mandatory to keep it looking good. Having flow just for the sake of it, is not good enough, it needs to be efficient and most of all it needs to get water, nutrients and co2 everywhere in your tank. Now that we discussed flow and its importance I hope you can go back to your tank and make it look great once more. When it comes to algae, there is none that hobbyists dread more that black beard algae (BBA). I mean we tend to see all algae as a nuisance and to some degree, they all require extra work from the hobbyist to get rid off. But what causes us to dread this algae so much more than the others is that once it takes hold of the aquarium, it is really hard to get it out. BBA is actually part of the Rodophyta family and it's primarily considered a marine algae. however some strains of this algae are common to freshwater too. Despite its darker colour, it is a red algae. It grows in furry patches that closely resemble beard, it's colour goes from dark green, black or redish. Hence its name black beard algae. It normally grows on equipment, hardscape or in the leaves of plants, slow growers like anubias are extremely vulnerable to it. 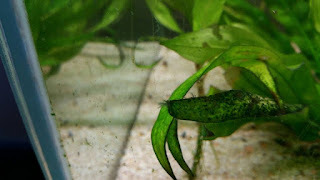 Has my quest to blog our aquariums out of algae continues, today we will have a look at another type of algae that as made many hobbyists tear down their tanks and give up on frustration. Together with Black Beard algae it is one of the toughest ones to kill. I am of course referring to Blue green algae also known as cyanobacteria. Now to set things straight this algae is in fact not an algae, it's a bacteria and an outbreak in the tank should be considered an infection instead of an infestation. They are part of large group of organisms that can live in all kinds of environments and are known to survive very extreme conditions. Because it is a bacteria and not an algae, just emptying and cleaning up the tank is generally not enough to kill it. That explains why some hobbyists keep getting infected with this thing over and over again. Its been quite some time since my last blog post and a lot has happened since then. The last time i wrote here was about the George Farmer event at aquarium gardens, since then i have moved away from London to Portugal. Settling in, finding a new job and a baby on the way meant that blogging and doing videos on youtube as taken a back seat. It doesn't mean that nothing has happened around here aquarium wise, quite the contrary. It just means i didn't have time to write about it. At the moment i have four aquascapes running at home, some looking better than others, but points given for trying. Today's article is about one of those scapes, i named it the old forest and it was my last aquascape assembled in the UK. The layout is a treescape loosely based on Filipe Oliveiras's earlier tree designs.